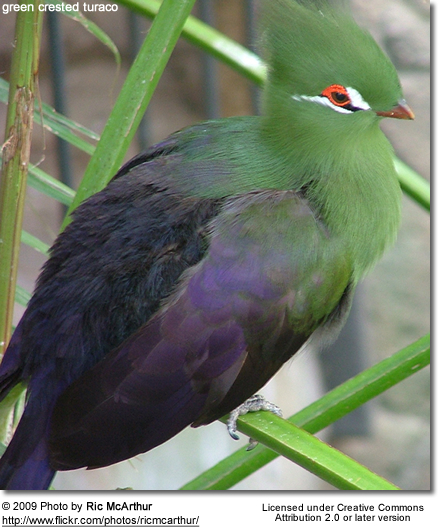 The Green Turaco or Green-crested Turaco, Tauraco persa, is a large turaco that is native to the forests of tropical west Africa. It is even more dependent on this habitat than the Violet Turaco. Within its distribution range, it generally prefers mature rain forest edge habitats, bordered by rivers, cultivated and urbanised environments from sea level to around 1100m. 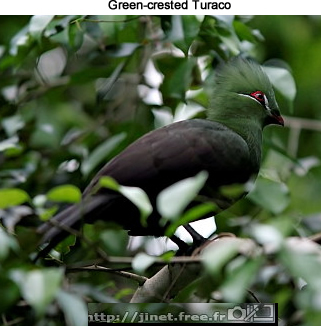 Green-crested (T.persa persa) - nominate formBuffon's Turaco (T.persa buffoni)Guinea Turaco (T.persa zenkeri). This species is a common breeder in climax forest with plentiful tall trees. It usually lays two eggs in a tree platform nest. 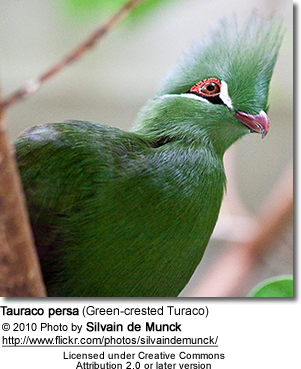 Green Turaco has a loud cawr-cawr call. The Green Turaco is a truly striking bird, with a brilliant green and blue plumage, thick red bill and red and white eye patches. They have a green crest. 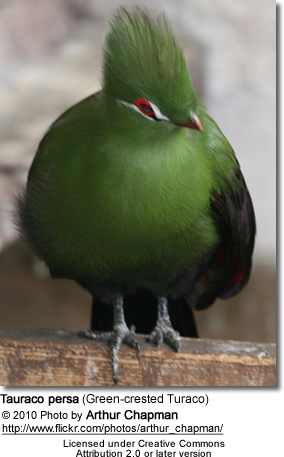 In flight, Green Turaco's crimson primary flight feathers contrast with the green plumage. This large turaco measures around 40-43cm from beak to tail, and weighs between 225-290 grams. These are unmistakable birds, although often inconspicuous in the treetops. 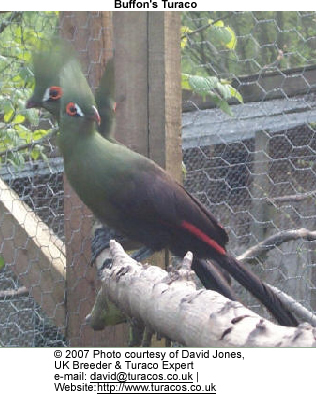 If you are interested in purchasing a Turaco, please visit this website for available birds and pricing.